“Don’t you sit upon the shoreline and say you’re satisfied. A post is going around Facebook—a Venn diagram of two circles—one small and one large. 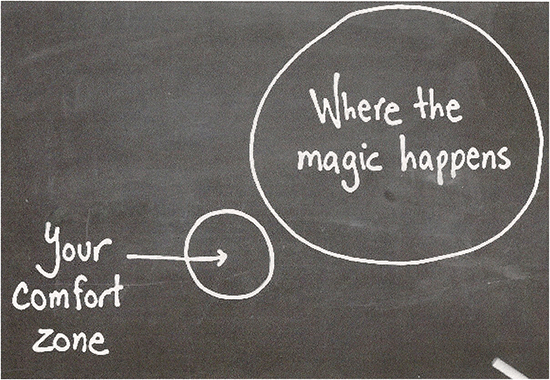 The small tight circle is labeled “Your comfort zone.” Written inside the large expansive circle is “Where the magic happens.” Most Venn diagrams have intersections where the circles overlap, but this one does not. The two circles float independently in space. The lesson being—you have to get out of your comfort zone to find life’s magic. We all understand the concept, right? As a shrink, I totally embrace (and preach) the value and necessity of doing things differently to achieve longed-for results. Fight your imprisoning fear! Break free of complacency! Embrace change! Get out of your comfort zone! How many times I’ve counseled others to “sit with the discomfort” of doing things differently! However… as an inveterate introvert, I’m immensely satisfied staying safely within my own comfort zone. I’ve lived in the same house for thirty-one years, practiced psychology for thirty-two, and my longest friendships span forty-eight years. A creature of habit, I cling to my rituals. And I LOVE my life! I love my home, my career, and my friends. My personal comfort zone has been a rewarding place to reside. And, yet… there is the matter of the book I’ve written. Even writing East of Mecca became a comfort zone of sorts. I worked on it in one form or another for twenty-five years. All along the way I held the vision of one day completing it and having it reach the masses. What I failed to visualize was how that would actually look. I imagined the story out there, but didn’t imagine myself out there! The picture of personally showing up and promoting the book would have filled me with terror. I imagined authoring the book, but never imagined being an author. And now I am. To prepare for the release of East of Mecca and establish myself as a writer, I created my website in October 2012 and started writing blog posts. Being a private person, I’ve been taking tiny steps outside my comfort zone ever since. The responses have been rewarding and reinforcing, but I was able to stay somewhat incognito. Now that my book is published, I have to show up live and in-person. I have had to fight my fear and shyness—to sit with my discomfort— in order to follow my mission. And—WOW! Leaving my comfort zone has indeed led me to magic! At this point I’ve spoken in front of large groups of strangers, something I never imagined being able to do. 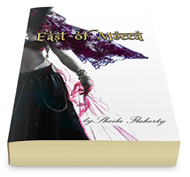 I’ve been enthusiastically welcomed into book clubs comprised of lovely people who have read East of Mecca and had insightful comments and questions. On the 25th of June, I had my official book launch at Women and Children First Bookstore where over seventy people showed up to support me and my work. The standing-room only crowd included family, new and long-time friends, current and former patients, and total strangers. Instead of anxiety, I felt the amazing energy, support, and love that filled the room. I felt awestruck and grateful. I felt joy. I felt the magic! In the Venn diagram, the large expansive circle hovers high above the small tight circle—as if magic lifts us up like a helium balloon. I believe it does, because I’ve been floating in a cloud of gratitude ever since beginning this process. And every single step out of my comfort zone adds more helium to my magic zone! I feel as if I can do anything! There are many lessons to be learned here. I know it will always be a push for me to show up in front of strangers. I know it won’t always be without “blips.” But I know I never want to stop feeling the awesome gratitude and joy that comes from achieving a long-time dream. And I have great satisfaction from being able to practice what I preach! In my last blog post I spoke of the soundtrack I played incessantly during the process of writing East of Mecca. But since it came out in 1992, the song The River by Garth Brooks, has been part of the soundtrack of my life—especially while working to make my dream come true. It never fails to inspire me. I hope it does the same for you. Wonderful post Sheila! So proud you are getting out there!